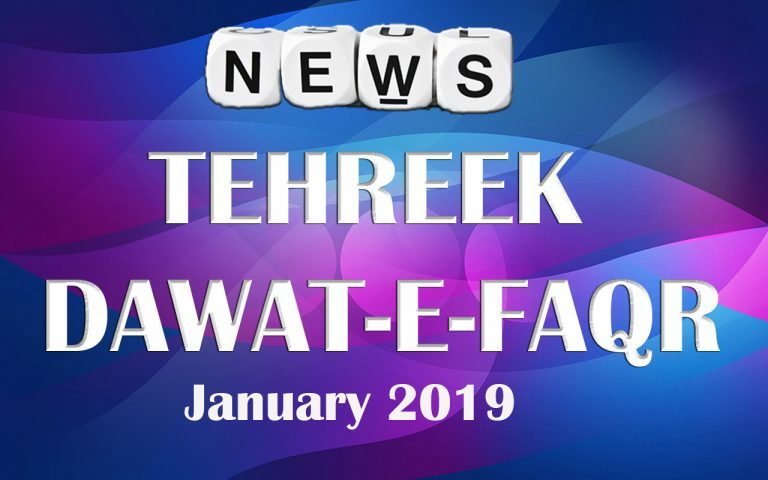 Tehreek Dawat e Faqr News January 2019 | Tehreek Dawat e Faqr Regt. On Tuesday 25th December 2018, Sultan-ul-Ashiqeen Sultan Mohammad Najib-ur-Rehman visited Shahpur Sadr, district Sargodha. Evidently, the aim of this missionary tour was to spread the message of Ism-e-Allah Zaat among people. In this tour Sahibzada Sultan Mohammad Murtaza Najib, admin Tehreek Dawat-e-Faqr and a large number of other disciples accompanied him. His convoy left Lahore at 7:00 am and reached Shahpur Sadr at the residence of Malik Mohammad Ameer Awan Sarwari Qadri around 11:45 am. To welcome Sultan-ul-Ashiqeen not only the local disciples of Shahpur Sadr but the disciples from the surrounding cities were also present. Evidently, these disciples were anxiously waiting there even before his arrival just to get the glimpse of their beloved Murshid. Finally, when the convoy reached the residence of Malik Mohammad Ameer Awan Sarwari Qadri all the disciples warmly welcomed him. Clearly, on his arrival a great zeal and devotion of the disciples could be felt in the air. As the echo of Allahu Akber and other slogans stating the grandeur of Prophet Mohammad and Sultan-ul-Ashiqeen could be heard from everywhere. 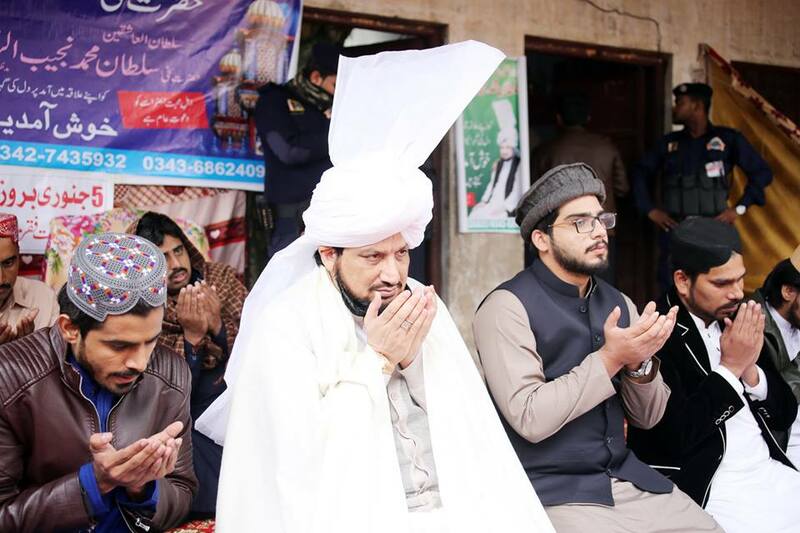 Additionally, people expressed their devotion by calling Sultan-ul-Ashiqeen the revival of religion and Imam-e-Mubin (the enlightened leader) etc. Concurrently, the disciples also showered his car with the petals of red roses. Indeed, the presence of Sultan-ul-Ashiqeen had filled the atmosphere with Divine light. After the warm welcome, Sultan-ul-Ashiqeen entered the residence of Malik Mohammad Ameer Sarwari Qadri along with his disciples. After the arrival of the huge convoy, the organizers settled down all the devotees and disciples. 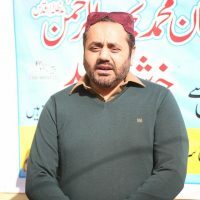 Then Mohammad Farooq Zia Sarwari Qadri addressed the audience. He delivered a comprehensive speech educating about the reality of Ism-e-Allah Zaat. Not only that, he also beautifully explained the importance of the invocation and contemplation of Ism-e-Allah Zaat and Sultan-ul-Azkar “Hoo”. Furthermore, he elaborated that the main aim and purpose of life, which is certainly recognition and marifa (gnosis) of Allah. He explained that the only way to achieve it is by following the perfect spiritual guide. As the perfect spiritual guide himself has attained gnosis of Allah. Then he elaborated the importance of following and being in the company of the perfect spiritual guide. Lastly, he introduced Sultan-ul-Ashiqeen who indeed is the perfect spiritual guide, complete guidance and the man of Divine Essence. He persuaded the audience to succeed in achieving the real purpose of life by taking oath of allegiance on the hand of Sultan-ul-Ashiqeen. 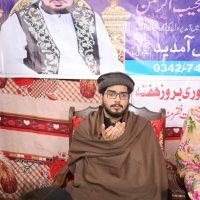 Mohammad Naeem Abbas Khokhar Sarwari Qadri, the chief executive of Tehreek Dawat-e-Faqr hosted the ceremony and gave the welcoming speech. Followed by that was the recitation from the holy Quran by Ahsan Ali Sarwari Qadri. After that Mohammad Ramazan Sarwari Qadri recited the kalam written by Mohammad Saeed Sarwari Qadri. Everyone praised Mohammad Ramazan Bahoo by saying Mashallah and Subhan Allah. 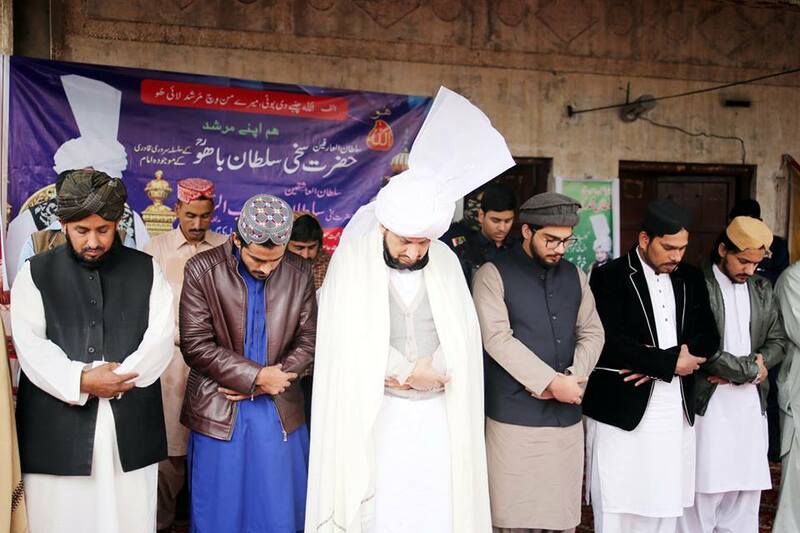 Then, Mohammad Farooq Zia Sarwari Qadri concluded the ceremony by supplicating to Allah for everyone’s well-being. 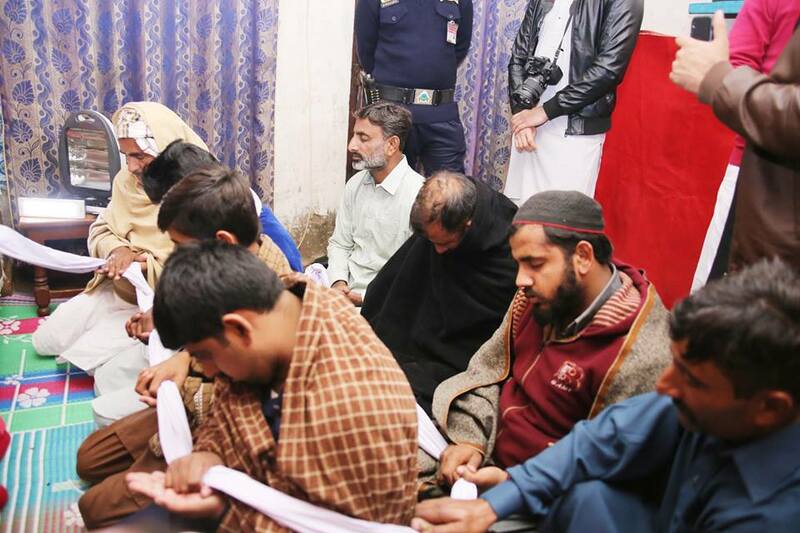 Afterwards, the fortunate seekers of Allah took oath of allegiance on the hand of Sultan-ul-Ashiqeen. He also blessed the inward of the seekers with the Divine light and granted Ism-e-Allah Zaat. Lastly, the organizers of the program served lavish langar (food) to the audience. Afterwards, Sultan-ul-Ashiqeen offered the Dhuhr (noon) salat with all his devotees and disciples. On this occasion the women seekers of Allah were also present who anxiously awaited to get the blessings of Sultan-ul-Ashiqeen. Therefore, he met the women seekers and spiritually blessed them as well. The auspicious ones who wanted to achieve the real purpose of life took oath of allegiance. Sultan Mohammad Najib-ur-Rehman also granted them with invocation and contemplation of Ism-e-Allah Zaat. To further spread his blessings, Sultan-ul-Ashiqeen stopped at the residence of Haji Mohammad Gulzar. Here, devotees and several relatives of Mohammad Gulzar anxiously awaited to warmly welcome Sultan-ul-Ashiqeen. As soon as Sultan-ul-Ashiqeen’s car reached near his residence, the devotees raised slogans stating glory of Sultan-ul-Ashiqeen. 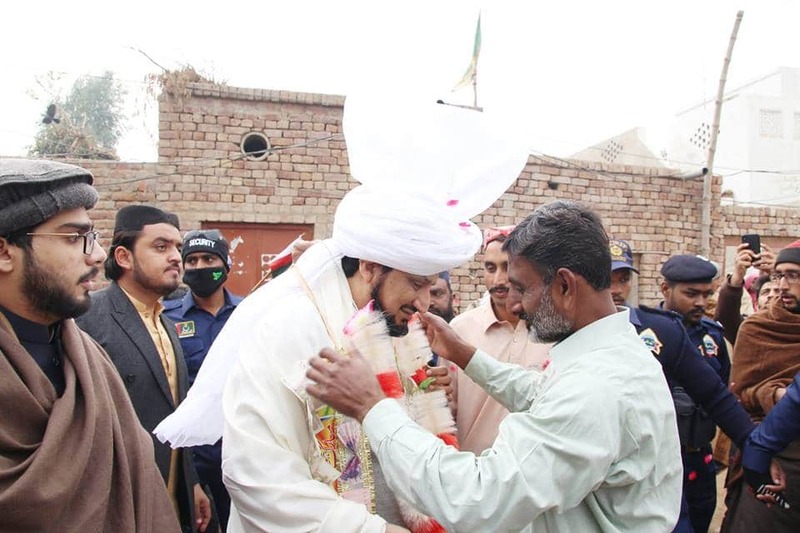 Undoubtedly, the local residents were very enthusiastic to welcome, meet and get benevolence from the exalted personality of Sultan-ul-Ashiqeen. One could notice their passion and zeal by the loud pitch of their slogans and chants. On this auspicious moment Haji Gulzar welcomed Sultan-ul-Ashiqeen with a beautiful garland and kissed his hands out of respect. 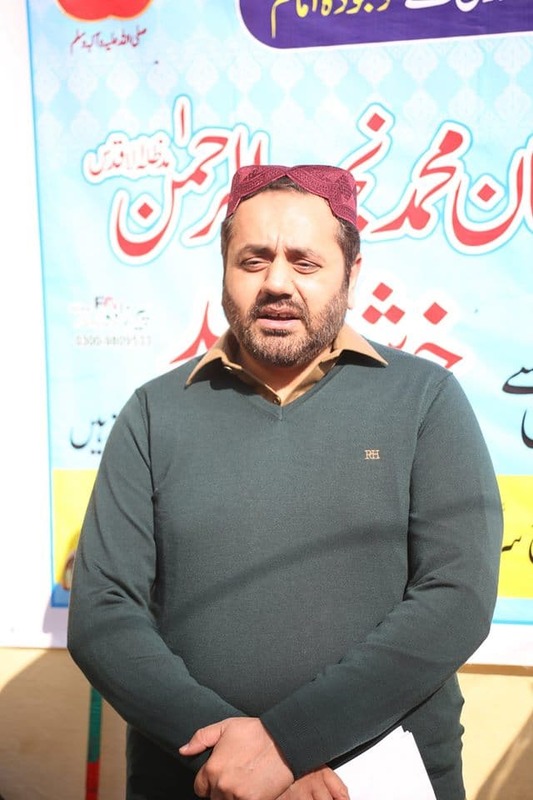 Once again Malik Mohammad Naeem Abbas was the compere of the ceremony. He started the ceremony with the welcoming speech. Then he invited Mohammad Bakhsh to have the honour of recitation from the holy Quran. 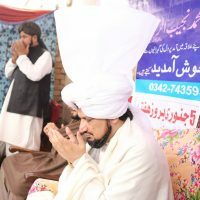 Followed by him, Sajid Ali Sarwari Qadri recited encomiums in the court of holy Prophet. 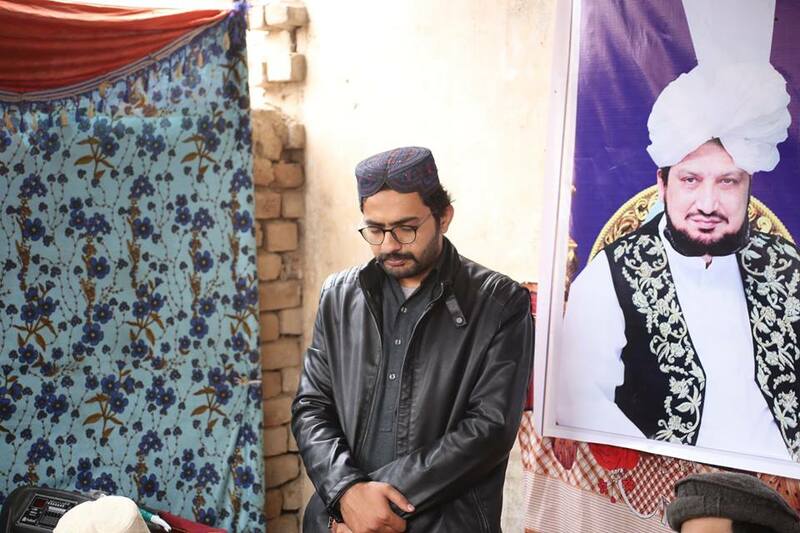 After that, he recited the eulogies of Sultan Bahoo which received great appreciation and praise. Lastly, Mohammad Farooq Zia ended the ceremony by praying for the prosperity of the audience and the Muslim Umma. Later, the management served sweets and tea to the audience. Then Haji Mohammad along with his whole family took oath of allegiance at the hand of Sultan-ul-Ashiqeen. Several other people who were inspired by the Divine personality of Sultan-ul-Ashiqeen also swore oath on his hand. Indeed, these people gathered his benevolence and the eternal blessing of the contemplation and invocation of Ism-e-Allah Zaat. 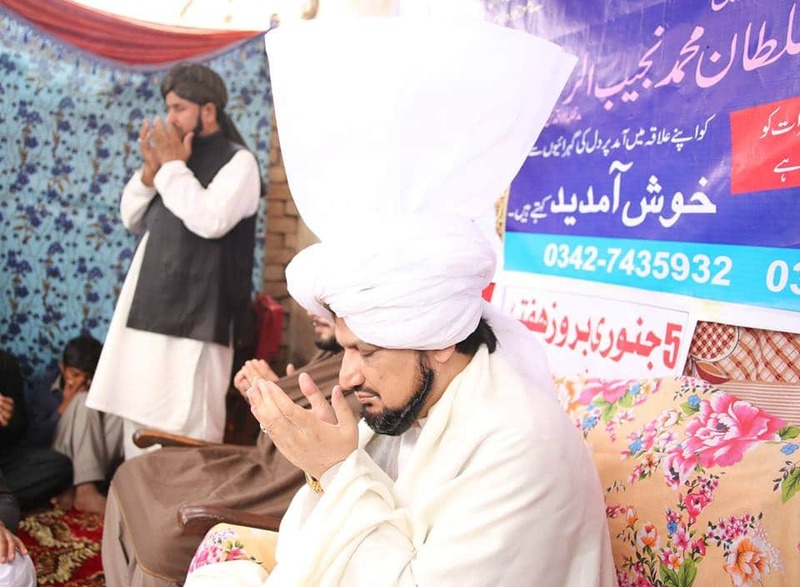 Finally, Sultan-ul-Ashiqeen prayed in the court of Allah for the everyone’s spiritual beneficence. Later, under his supervision the convoy left for Lahore around 4 pm. Undoubtedly, Sultan-ul-Ashiqeen is the spiritual successor of Sultan Bahoo. Also, he is the perfect spiritual guide and the man of Divine Essence of the present era. Sultan-ul-Ashiqeen has been struggling since long to spread Faqr, which is the true heritage of Prophet Mohammad. He has made countless efforts to unveil the treasure of invocation and contemplation of Ism-e-Allah to individuals from all walks of life. Therefore, every year to fulfil this mission Sultan-ul-Ashiqeen take several tours in every corner of the country. This year, his first tour was on 5th and 6th January, which was the first weekend of the year. 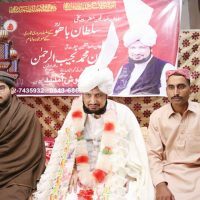 Sultan-ul-Ashiqeen, alongwith his son Sultan Mohammad Murtaza Najib and the convoy went to Buchiana Mandi tehsil Jaranwala district Faisalabad. On Saturday, 10:00 am, 5th January 2019, Sultan-ul-Ashiqeen alongwith Sahibzada Sultan Mohammad Murtaza Najib and his convoy left Sultan-ul-Ashiqeen house for the spiritual tour. From the beginning of this journey, the members of the caravan felt inner peace and serenity. Apparently, the weather had been very dry and foggy a couple of days before the tour. Also, thick clouds of fog had covered every inch which made it hard for anyone to travel. But miraculously it rained the night before the tour which cleared the sky. At this point, the weather became clear, pleasant and convenient for traveling. Indeed, this was by the blessings of Sultan-ul-Ashiqeen. 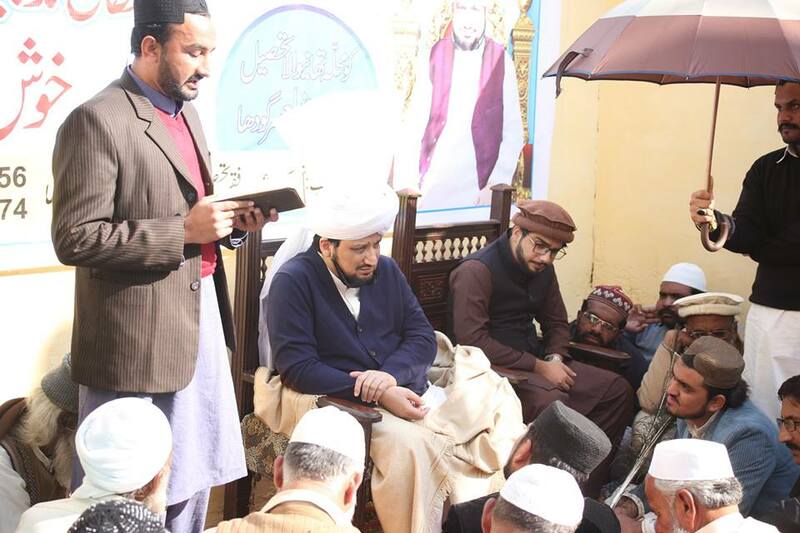 It was a pleasant noon of the 5th January 2019 when Sultan-ul-Ashiqeen’s caravan reached Buchiana Mandi tehsil Jaranwala district Faisalabad. Here, the locals came out of their houses to see Sultan-ul-Ashiqeen as his caravan was passing through the city. Then around 12 pm he arrived at he residence of Mohammad Ashfaq in Chak no. 560 GB Awanawala. 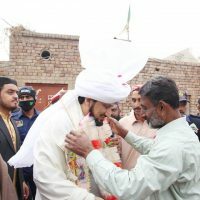 Subsequently, thousands of seekers of Allah, devotees and disciples respectfully queued to welcome Sultan-ul-Ashiqeen and Sahibzada Murtaza Najib. They welcomed them with the shower of rose petals and booming chants. All town heard the echoes of Allahu Akber and chants in the honour of Prophet Mohammad and Sultan-ul-Ashiqeen. Moreover, people were calling Sultan-ul-Ashiqeen Imam-e-Mobeen (the enlightened leader) and Nur-e-Yaqeen (the light of certainty). 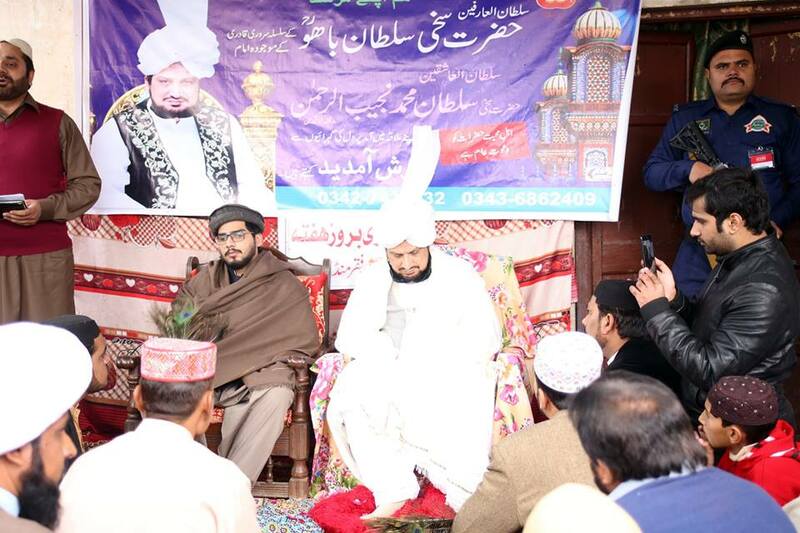 Mohammad Ashfaq had held Mawlid ceremony in the honour of Sultan-ul-Ashiqeen. Before the formal initiation of the ceremony Mohammad Farooq Zia spoke about the importance of Ism-e-Allah Zaat. He also shed some light on the real aim of life and significance of perfect spiritual guide in achieving it. Afterwards, the ceremony formally started on the arrival of the chief guests, Sultan-ul-Ashiqeen Sultan Mohammad Najib-ur-Rehman and Sahibzada Murtaza Najib. 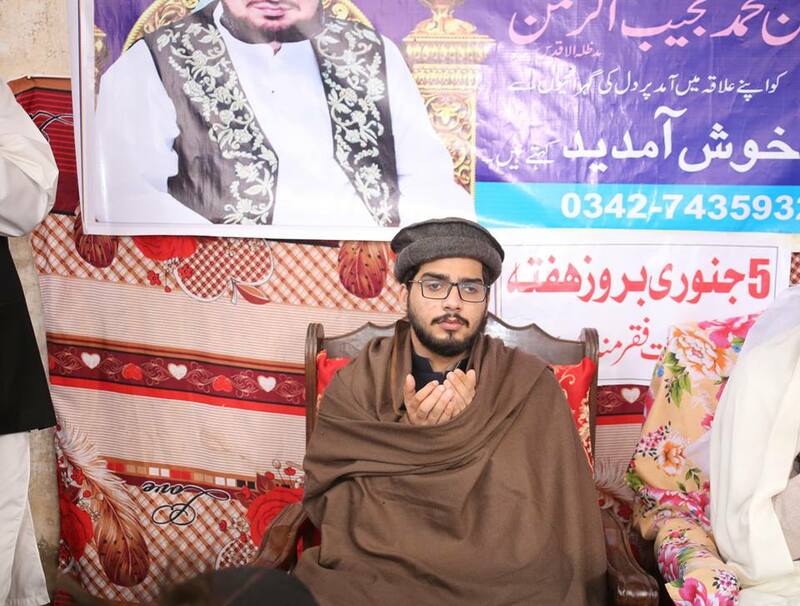 Malik Mohammad Naeem who is the chief executive of Tehreek Dawat-e-Faqr hosted the ceremony. First of all, he invited Nasir Majeed for the recitation from the holy Quran. Meaning: Certainly, Sultan Mohammad Najib-ur-Rehman is the manifestation of Allah and the light of Prophet Mohammad. My spiritual guide is renowned as Sultan-ul-Ashiqeen which means the Sultan of the Divine lovers. At the end of the ceremony Mohammad Farooq Zia prayed for everyone’s well-being. After the ceremony, Sultan-ul-Ashiqeen took oath of allegiance from the fortunate seekers of Allah (both men and women). He also granted them invocation, contemplation of Ism-e-Allah Zaat alongwith the practice of inscribing name of Allah on body. After the oath of allegiance, Sultan Mohammad Najib-ur-Rehman and Sahibzada Sultan Mohammad Murtaza Najib offered the Dhuhr salat in congregation. 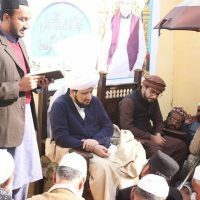 On this occasion Mohammad Aslam Sarwari Qadri had the honour of Imamate. After Dhuhr salat Sultan-ul-Ashiqeen had the farewell meeting with the family of Mohammad Ashfaq. Then alongwith his caravan he left for his next destination, Chak 656/7 GB, Buchiana Mandi, tehsil Jaranwala, district Faisalabad. Here he was going to visit the house of Mohammad Salamat Sarwari Qadri. 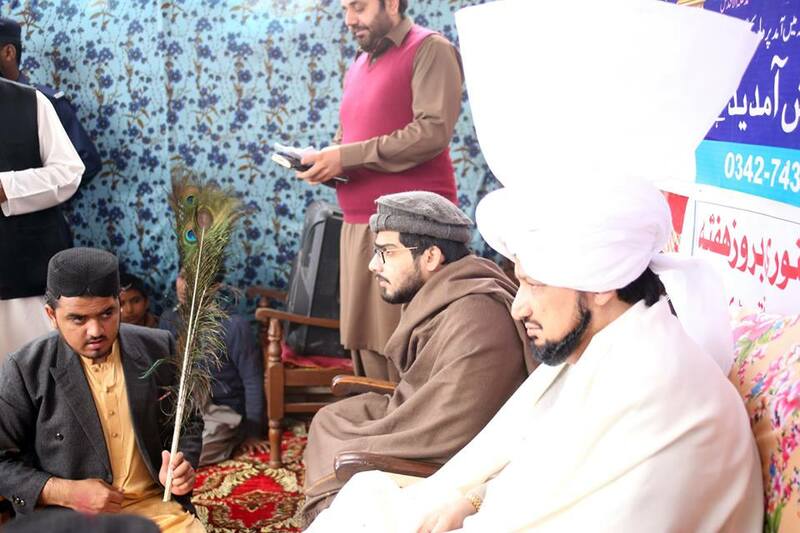 Sultan Mohammad Najib-ur-Rehman alongwith Sahibzada Murtaza Najib and the caravan went to Mohammad Salamat’s house which located in Chak 656/7GB. A mob of seekers of Allah, devotees and disciples warmly welcomed him with red rose petals and zealous chants. As a notion of joy and devotion Mohammad Salamat had decorated his house with flowers and flags of Tehreek Dawat-e-Faqr. 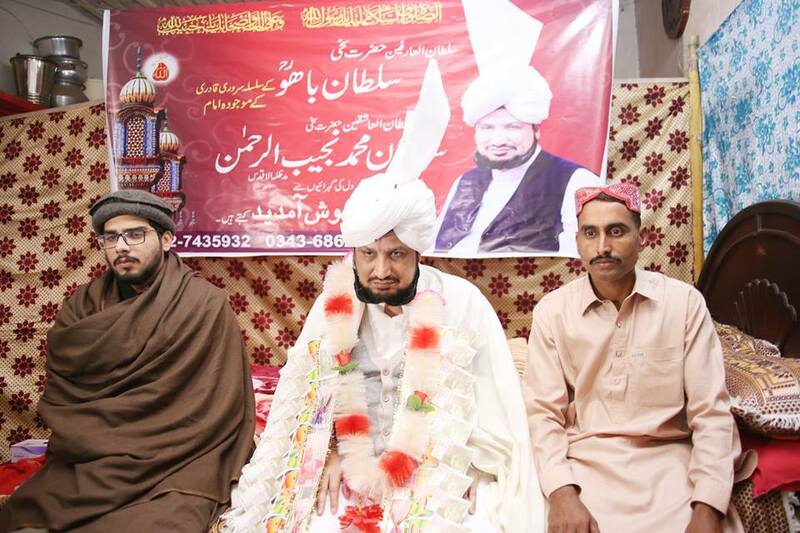 Here as well, Sultan-ul-Ashiqeen individually greeted people of the town and prayed for their prosperity. After Chak no. 656/7 GB, Sultan-ul-Ashiqeen alongwith his caravan advanced towards his third stop of the day which was the residence of Mohammad Danish and Ali Raza in Buchiana Mandi. It started raining on his arrival but that did not stop his devotees and seekers of Allah from seeing him. Here as well, the seekers of Allah were anxiously waiting for his arrival. On his arrival, seekers welcomed him by showering rose petals on him and his car. Again, the atmosphere resounded with the chants of Allahu Akber, grandeur of prophethood and perfect spiritual guide. Here as well, a mob of fortunate men and women seekers of Allah took oath of allegiance. Then Sultan Mohammad Najib-ur-Rehman granted them eternal wealth and blessing of Ism-e-Allah Zaat. Finally, he took time to individually meet and greet the residents of the town and prayed for their welfare. Once again Sultan-ul-Ashiqeen alongwith his caravan departed towards his next destination, which was the fourth stop of the day. Now he was headed towards the residence of Mohammad Qadeer Iqbal who is also the member of ‘consultation committee’. He had made arrangements for the night stay of Sultan Mohammad Najib-ur-Rehman and his caravan. The spiritual convoy of Sultan-ul-Ashiqeen reached the residence of Mohammad Qadeer at the time of Asr (afternoon) salat. Here as well, the whole town warmly welcomed him and had the honour to meet him. Once again, the atmosphere echoed with the slogans of Allahu Akber and other chants on grandeur of prophethood and Sultan-ul-Ashiqeen. Here at first, he offered the Asr (afternoon) salat in congregation. Then finally he got to rest for some time after a long day. Later, he offered the sunset (Maghrib) and night (Isha) salat in congregation. On the morning of 6th January, after breakfast, numerous men and women had the honour of taking oath of allegiance. Sultan-ul-Ashiqeen enlightened their inwards by granting them the last resort of Ism-e-Allah Zaat which is the invocation of Hoo. Later, from the house of Mohammad Qadeer, Sultan Mohammad Najib-ur-Rehman left for houses of Mohammad Ramazan and Falak Sher. Here on arriving at Mohammad Ramazan’s house Sultan-ul-Ashiqeen prayed for him and his family’s outward and inward well-being. Later in the same town, Sultan-ul-Ashiqeen then stopped at the residence of Falak Sher and prayed for the prosperity of his family. After praying in Chak no. 561, the missionary caravan of Sultan-ul-Ashiqeen left for Chak no. 625 GB. When the caravan of Sultan-ul-Ashiqeen reached the residence of Mohammad Farooq, a mob awaited to warmly welcome him. The whole village could hear echo of chants and slogans raised in grandeur of Sultan-ul-Ashiqeen. Here as well, Sultan-ul-Ashiqeen embraced and prayed for all the devotees and disciples. Sultan-ul-Ashiqeen took oath of allegiance from the fortunate seekers of Allah. He also granted them with the incomparable and everlasting wealth of contemplation and invocation of Ism-e-Allah Zaat. Not only that but he also demonstrated the practice of inscribing the personal name of Allah on body. Meaning: Sitting in the company of the perfect spiritual guide is better than the hypocrite worship of hundreds of years. Afterwards, Mohammad Aslam taught the method of invocation to the people who took oath of allegiance. Finally, Sultan-ul-Ashiqeen prayed for the family and did a farewell meeting with them. Then his caravan left for 534 GB Kakarwali. When Sultan-ul-Ashiqeen arrived at Mr. Zamaan’s residence with Sahibzada Murtaza Najib and caravan, the welcoming was worth seeing. As the enthusiastic devotees and other people of the village warmly welcomed them with rose petals and loud chants. The seekers of Allah took oath at the hand of Sultan-ul-Ashiqeen and he granted them with Ism-e-Allah Zaat. After praying for everyone’s well-being, Sultan-ul-Ashiqeen alongwith his caravan left for Niazi house in Chak 657/8 GB. Like all previous places, Sultan-ul-Ashiqeen received an extravagant welcome over here as well. The air was enriched with the fragrance of rose petals and echo of enthusiastic chants. Additionally, the audience honoured Sultan-ul-Ashiqeen and Sahibzada Murtaza Najib by raising slogans stating their majesty. Sultan Mohammad Najib-ur-Rehman, Shahibzada Murtaza Najib and the caravan offered Dhuhr (noon) salat congregationally. On this instance Mohammad Aslam had the honour of imamate. After salat, Sultan-ul-Ashiqeen had the farewell meeting the family of Mohammad Niazi. He prayed for their prosperity and then the caravan under his supervision left for Lahore. Later that evening around 6:00 pm, the caravan reached Sultan-ul-Ashiqeen house in Lahore. Here, Sultan Mohammad Najib-ur-Rehman ended his tour by saying goodbye to the members of the caravan. According to the constitution of Tehreek Dawat-e-Faqr, the annual elections for year 2019 took place in December 2018. These elections were supervised by Sultan Mohammad Najib-ur-Rehman who is the patron in chief of the Tehreek. Above mentioned elected officials took charge after taking oath on the hand of Sultan-ul-Ashiqeen after Isha (night) salat on 1st January 2019. As per constitution, Tehreek demotes the member not present on the oath taking ceremony. The oath taking ceremony of the aforementioned members of the general council took place on January 25th, 2019. Zafar Iqbal who is the resident of Gujran Jehlum actively take part in progression of Tehreek Dawat-e-Faqr. One of his efforts is to hold learning and teaching lessons on his residence weekly. Apart from that he also arranges book stalls of Sultan-ul-Faqr publications in his community. 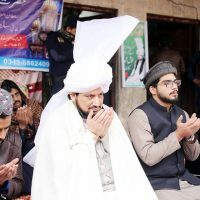 On Friday, 21st December 2018, he arranged a book stall of Sultan-ul-Faqr publications at the Eidgah Mosque in Jehlum. As a result of his efforts, the stall was successful, and community showed interest for future stalls as well. See photos of the event below. Again, on the following Friday, 28th December 2018, he arranged another book stall in the mosque Kalan Gujran Jehlum. This stall was yet another success as the local community purchased a lot of books. Later, Mohammad Iqbal started arranging weekly learning and teaching lessons at his residence. Certainly, the sole purpose of these lessons is to educate and invite people towards the gnosis of Allah. Next Friday, on 4th January 2019, Mohammad Zafar Iqbal held a teaching lesson at his residence. Here people were taught about the true spirit of Islam from Sultan-ul-Ashiqeen’s famous book called ‘Shams-ul-Fuqara’. Again, on Friday, 11th January 2019, Tehreek Dawat-e-Faqr arranged a book stall at Kalan Gujan mosque in Jehlum. Just like previous book stalls, this turned out to be a great success. As many devotees and bibliophiles not only praised but also purchased the books. 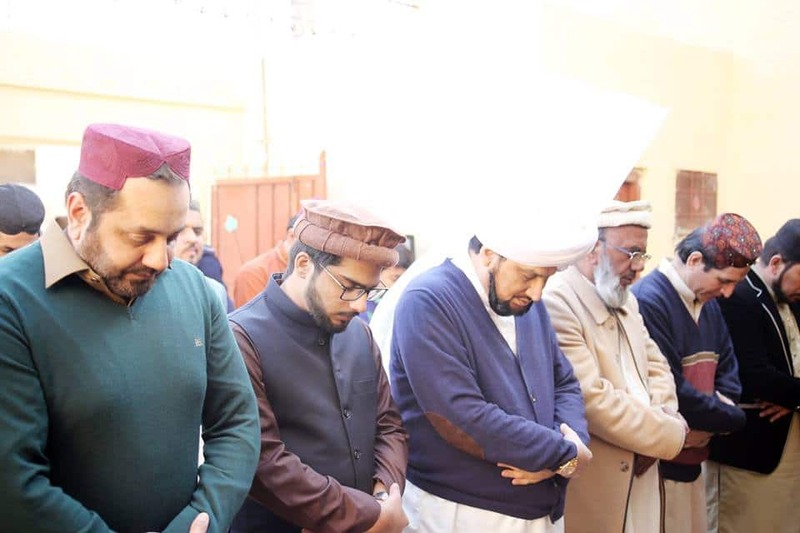 On Friday, 4th January 2019, Tehreek Dawat-e-Faqr Haroonabad held teaching lessons at the residence of Mazhar Hussain Sarwari Qadri. In this city as well, local community admired it a lot and is looking forward to more events like that. Below are a few pictures from the event. Firstly, Sultan-ul-Faqr publications held a book stall at the time of Friday salat, on 7th December 2018, in al-Medina mosque, Khor city. Many people after the salat bought books and praised this effort to spread the message. We have given the pictures below. Furthermore, admin Tehreek Dawat-e-Faqr- Khor city arranged another stall at the aforementioned place on Friday, 28th December 2018. The following pictures captured some enthusiastic moments. Similarly, on Friday 4th January 2019, another book stall was arranged at al-Medina mosque in Khor city. Lastly, on 11th January 2019 Sultan-ul-Faqr publication held another book stall at the mosque of the Khor city. Not to mention, in this stall ‘Haqeeqat-e-Ism-e-Allah Zaat’ a precious book written by Sultan-ul-Ashiqeen caught everyone’s attention. 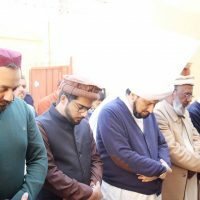 Like other cities, Tehreek Dawat-e-Faqr Uch Sharif on Saturday, 17th December 2018, organized a ceremony of Durood and salutations. 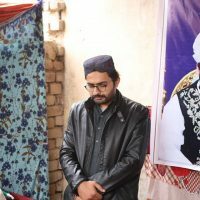 Precisely, this ceremony was at the residence of Mohammad Tariq Sarwari Qadri who is the supervisor Tehreek Dawat-e-Faqr Uch Sharif. On this occasion, he also arranged a teaching lesson of Sultan-ul-Ashiqeen’s famous book ‘Shams-ul-Fuqara’. A photographic glimpse of the event is given below. On Monday, 24th December 2018, Mohammad Tariq arranged another teaching lesson and Mawlid ceremony at his residence. During this large ceremony the passion and interest of the devotees was worth watching. In fact, many devotees requested to arrange more ceremonies like this in future as well. Furthermore, Tehreek Dawat-e-Faqr Uch Sharif arranged Mawlid and Dhikr ceremony on Monday 31st December 2018. 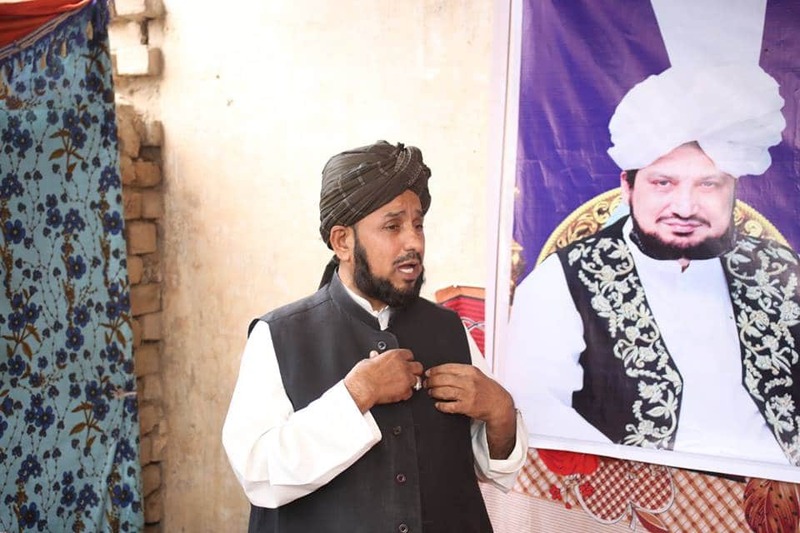 Again, Mohammad Tariq Sarwari Qadri also made arrangements for a lesson from Sultan-ul-Ashiqeen’s book ‘Shams-ul-Fuqara’. This event was certainly a success. As a large number of seekers of Allah attended the ceremony and praised it. Some pictures are as follows. 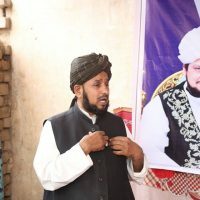 Thereafter, Mohammad Tariq held Mawlid ceremony and teaching lesson once again at his residence on 7th January 2019. 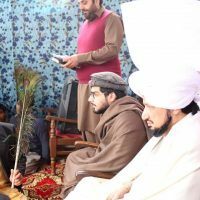 On this ceremony, a teaching lesson from ‘Shams-ul-Fuqara’ was arranged as well, which was the continuation of the previous session. Like other major cities of Pakistan, there is an office of Tehreek Dawat-e-Faqr in Mopalka, Gubba Fazal district Okara as well. This office held an important meeting on Thursday 6th December 2018 at the residence of Mian Mohammad Zamman. Evidently, the sole purpose of the meeting was to discuss the advancement of the local activities of the Tehreek. Also, make plan about the future preaching movements in the area. On Friday, 14th December 2018, Mohammad Afzal arranged a book stall with the help of Sultan-ul-Faqr publications. Following are some pictures of the stall. On Thursday, 20th December 2018, Tehreek Dawat-e-Faqr in Gubba Fazal organized a teaching and learning lesson at the residence of Asif Mehmood. Additionally, the local members also reviewed the local progress of Tehreek. Infact, they put together a plan on what steps to take for further advancement of the Tehreek in the area. On 14th December 2018, local office of Tehreek Dawat-e-Faqr in Bharot arranged a book stall of monthly Sultan-ul-Faqr and Sultan-ul-Faqr publications. They arranged the book stall in Meeran Haider Shah Bukhari shrine mosque. Similarly, on 4th January 2019 after the Friday salat in Pahrwal mosque Infact, Tehreek Dawat-e-Faqr distributed Sultan-ul-Faqr magazine for free to spread awareness about Faqr. On Friday, 28th December 2018 Mohammad Yusuf Akbar with the assistance of Sultan-ul-Faqr publication arranged a book stall. This book stall was in a mosque at Ilam Fatima Bhogiwal road China scheme mosque. Like other stalls of Tehreek Dawat-e-Faqr, this stall had a positive outcome. As people greatly appreciated and showed interest great collection of Sufi books by Sultan-ul-Faqr publication books.